Legacy of Poetry: Poetry on the Move! 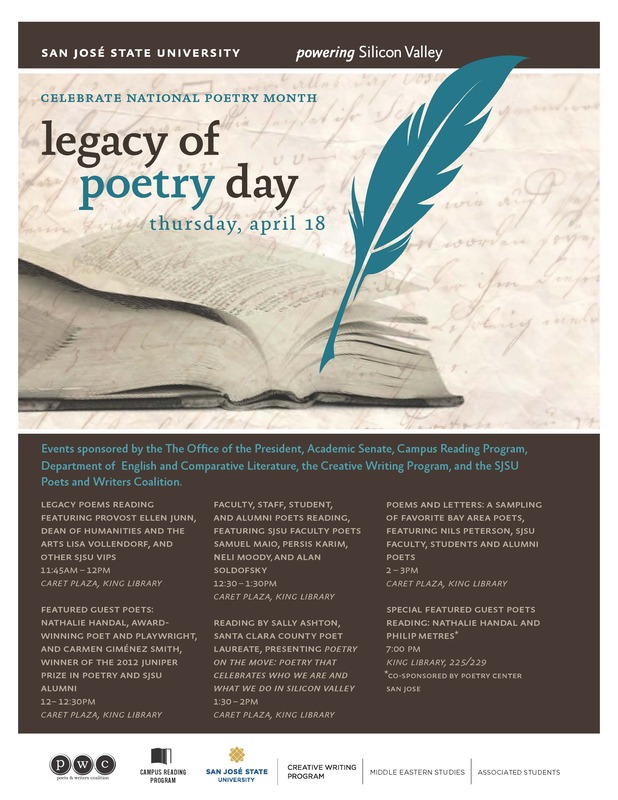 As part of San Jose State University’s annual Legacy of Poetry Day tomorrow, Thursday, April 18, I’ve been invited to host a reading of poems from our contest anthology, Invention. Nine readers answered my invitation to read. Each reader will read their own entry and one other. Our portion of the day-long event begins at 1:30 p.m. I will open the reading with “A Lightbulb Moment,” the poem from our youngest contributor, Zahra Attarwala of Saratoga, 11 years old at the time of her entry. While there were five poems chosen as winners, ALL entries appear in this fabulous anthology. I will have a few on hand for purchase. Here are tomorrow’s readers and the additional poem each has chosen. There is a full days’ events planned. Perhaps I will see you there. Parking available in the Fourth St. Garage across from the MLK Library. Come through the library into the plaza right out front on campus side. Full schedule at the event link above. Lovely, lovely. So sorry to miss! And sorry to miss your poem in the mix.